This challenge features summery colors to inspire you — In the Buff, Coral Crush, Gumdrop Green, and Blueberry. Barbara uses the colors from Color Challenge 47 to craft up a delicate bouquet of flowers using the Pretty Posies stamp set on vellum. 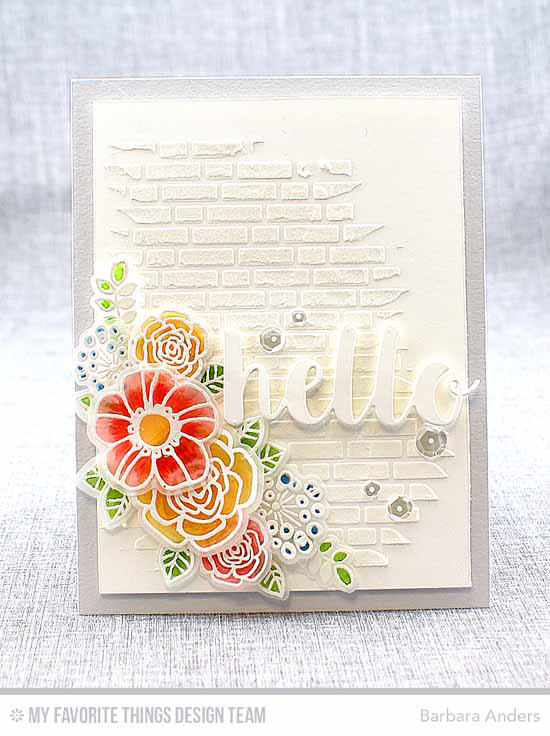 The textured background she created with the English Brick Wall Stencil is simply delicious! 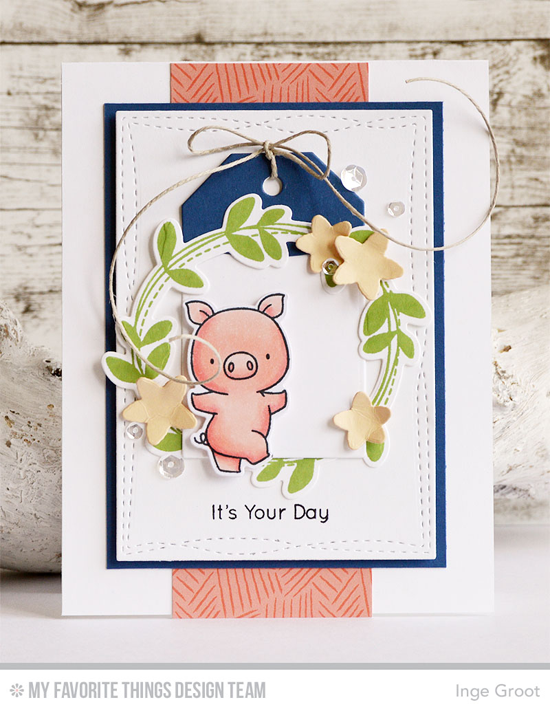 Karin's sweet design incorporates the colors with the super cute images from the Things with Wings stamp set. I love her Coral Crush dotted background created with the Myriad Dot Background stamp. Oh my goodness, that adorable piggie frolicking in a cute wreath! 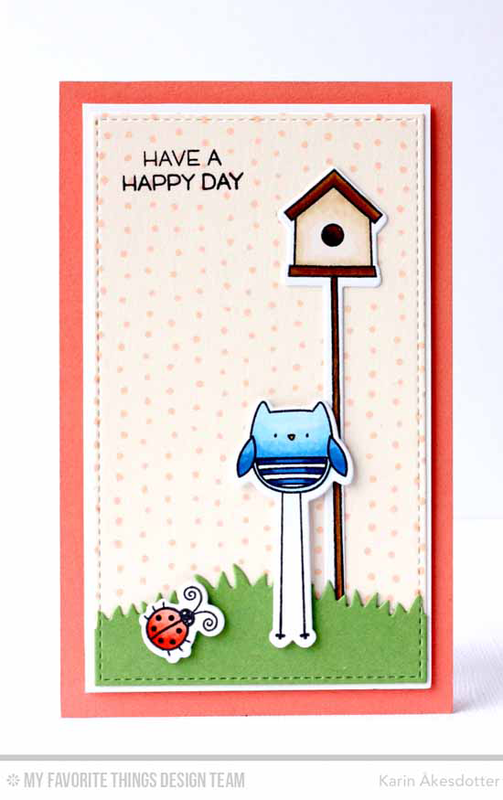 Such a whimsically fun design fun from Inge. Blueberry is a perfect anchor, and the Tribal Prints Paper Pack is a perfect fit for this color challenge. To learn more about matching MFT patterned papers to our colors, be sure to visit this link in our printable resources section. Congratulations, Blankina! You are the randomly selected winner of the MFT Color Challenge. You can view all the entries from the last challenge HERE. You have until Wednesday, June 22nd, at noon EDT to add your link and be eligible for the prize of up to $20 in MFT Cash. Winners are chosen at random, so everyone has a chance! The prize is a $15 Gift Voucher to My Favorite Things, but if you use MFT stamps and/or dies in your project, you’ll receive an extra $5. Yessss I have won! I am so lucky.